The 1960's saw a significant change in the shape and size of many American freight cars. It all began with the Southern Railway's Big John 100-ton covered hopper in 1960. The Southern felt that bigger cars should allow it to charge lower rates; but the Interstate Commerce Commission disagreed and the matter went all the way to the U.S. Supreme Court. The case was finally settled in the Southern's favor in January 1965; but even before the final decision the industry was moving towards cars of substantially greater capacity and cubic volume. Two of the iconic freight cars of that era, the 86-foot high-cube box car and the 8-axle tank car, first appeared in 1963. Almost all of these big cars rode on four axles, but at least 819 tank cars were built with six or eight axles. I call them RailWhales, and this web site is dedicated to these unusual, interesting and virtually extinct cars. RailWhales were not unique to North America; 5-foot-gauge 6- and 8-axle cars have operated in the Soviet Union and standard gauge 6-axle cars were built in Australia, and they are included here too! The production of RailWhales was ended by Federal regulation 35 CFR 14216 which prohibited the construction of any tank car with a maximum gross rail load exceeding 263,000 pounds or with a capacity greater than 34,500 gallons. These restrictions were proposed on 11 December 1969 and went into effect on 1 December 1970. The last RailWhales were completed the previous month. 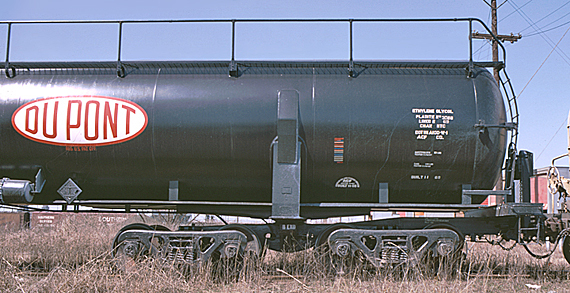 For many years the Federal Government has had a maximum age of 50 years for freight cars in free interchange service; but shortly after the last RailWhales were completed, the Association of American Railroads adopted new standards for freight car construction and established a service life of 40 years for cars built before 1 July 1974. While the AAR rules would eventually affect some RailWhales, most were gone long before they reached 40. When RailWhales was established in 2003 two-thirds of the RailWhales were already gone: 47% had been retired and an additional 16% had been rebuilt into 4-axle cars. By the end of 2010, 40 years after the last RailWhale was completed and seven years after this website was established, only 95 cars – all of them 6-axle Celanese cars in the CELX 6400- and 10400-series – remained in free interchange service, having been approved by the AAR for continued operation until they reach the Federal age limit of 50 years. For the web site's 10th anniversary all of the pages were revised and some new ones were added; and updates continue as new material becomes available and as time permits. The material on this site is subject to copyright and may only be used for private, non-commercial, non-profit purposes without the specific permission of the webmaster or photographer. I am always looking for new information and photos, so if you'd like to participate, contact the ME, Mike Palmieri.